Weekend getaways are vital to a healthy, balanced life. But trying to find a spot that separates itself from routine accommodations can be difficult. Fortunately, the Ontario's Highlands region — just 2.5 hours northeast of Toronto and 30 minutes west of Ottawa — offers a number of memorable spots to nestle into regardless of the season. While some are perfect for family vacations, others are ideal for those romantic getaways with your special someone. Presented in partnership with Ontario Tourism and Ontario's Highlands, here are a handful of places that will quench your thirst for some rest and rejuvenation while providing 'you-won't-believe-where-we-stayed' bragging rights. The rustic Open Loft Log Cabins, once used by 19th century loggers, are nestled into the ancient Haliburton Forest with an incredible wildlife reserve literally on your doorstep. 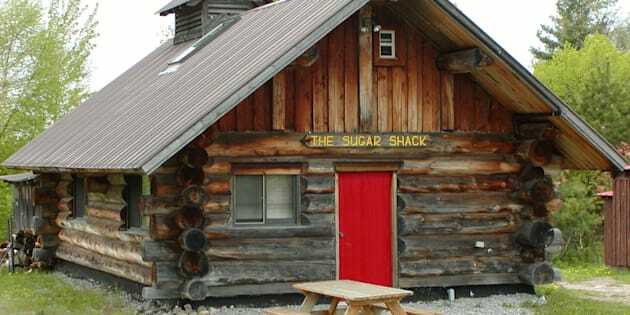 These adorably themed cabins (like the "Boiler Room" and "Sugar Shack") ooze charm and warmth. Visitors can breathe in the smell of timber, and listen to wolves howl nearby at night. No shortage of outdoor adventures like a walk in the trees along the world's longest canopy boardwalk of its kind, guided paddling tours, mountain biking, and the interpretive Wolf Centre make this a nature lover's dream. In winter, visitors can enjoy dogsledding and snowmobiling through the wilderness. Circa 1894 B&B, a gem of a Bed & Breakfast in Lanark County, is located in a former United Church that was built over 120 years ago. Today, visitors can enjoy the rustic architecture of this historic building, while being pampered in a spa that is anything but traditional. The lofty nave was transformed into cozy rooms with an eye towards environmental sustainability, using building materials from a 100-kilometre radius and a spa powered by solar energy. Guests can kick back in the Finnish-style sauna before dining on locally-grown, organic produce — much of which is grown on-site. Haven't you always wanted to stay in a treehouse? Well now you can, thanks to the Kafrissen family's labour of love. It took about three years to construct, mostly out of recycled materials, but the end result is well worth the trip to Lanark County. Big Jimmy Buffet fans, the owners built a second little hideaway further up in the trees, connected by a red cedar swing bridge, and named it Margaritaville (of course). From the outdoor shower and fire pit to its fully-equipped kitchen, The Treehouse experience balances roughing it like the Swiss Family Robinson, with modern conveniences and a dash of luxury. A king-sized bed in the loft makes for a romantic getaway unlike any other. Black River Retreat in Tweed provides the ultimate special occasion getaway. Catering to just one couple at a time, the entire property is yours during your stay — no lobby lineups, no sharing anything, except with your loved one. The cozy escape comes fully equipped with a crackling stone fireplace, giant log bed, and plenty of fluffy pillows to lounge against while enjoying a glass of wine. After a full day of exploring the forest trails or paddling the tranquil Black River, kick back with a gourmet, four-course meal and unwind beneath the stars in the cedar hot tub. The Railway Museum of Eastern Ontario in Smiths Falls gives you the unique chance to cozy up on a caboose in a museum. The wooden cabooses here date back to the 1940s and overlook the historic train station that serves as your hotel lobby and provides access to a kitchenette and washroom. Trains began rattling through this area in 1859, and the original train station is a national historic site. The glow of the lanterns will truly transport you back in time, but while you'll be overnighting it just like the old railroaders did, the pull-down comfortable beds and fresh linens are decidedly more upscale. You'll swear you can hear the wheels rattling and the carriage gently swaying as you drift off to sleep. Adventurers have been camping along the Ottawa River for centuries, but visitors to Elements Luxury Tented Camp and Nature Spa get to enjoy an opulent upgrade. The spacious prospectors' tents are stocked with luxury linens and gilt mirrors that once graced the halls of the famous Château Laurier in Ottawa. It even offers a wilderness butler service, complete with fresh towels. All meals are pre-prepped, ready to be cooked by you. You'll be able to roast s'mores over an open fire, go paddle-boarding along the private beach, relax by the lush, natural waterfall, or enjoy a yoga or art class. Whether you're looking to get away for a weekend this winter or planning your summer vacation, the variety of memorable options in Ontario's Highlands make this a can't miss destination.